AMIDST is designed to help enhance the process of finding structures, biomes, and players in minecraft. By accessing your minecraft files, it's able to draw the biomes of the world out and show where points of interest are likely to be. 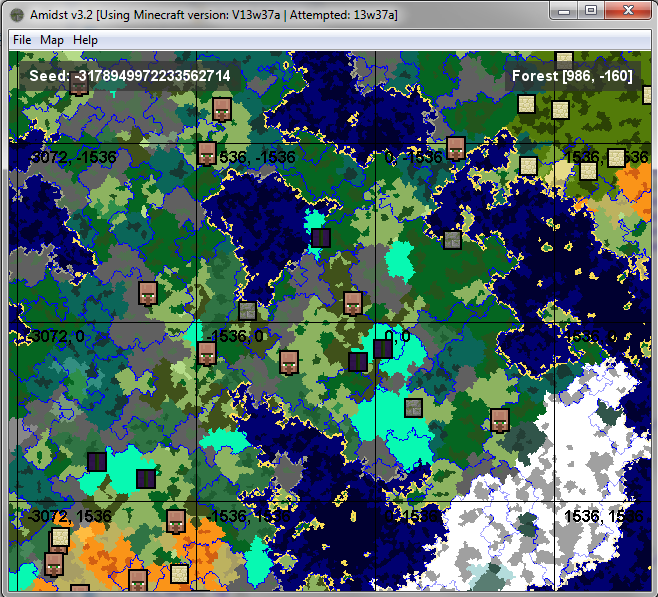 - Load map data from different versions of Minecraft. - Show modifications to the world. - Give information on individual blocks. [BUG] Spawn points, villages, temples, and witch huts may be slightly less accurate than normal. [BUG] Moving your player on the map WILL put you into the sky. It is unclear on how to fix this issue. [INFO] AMIDST uses Google Analytics to anonymously gather general statistics. [INFO] AMIDST attempts to check for updates each launch. [INFO] AMIDST is now completely open-source. Check it out on GitHub. Please report all bugs with as much detail as possible to the issue tracker. Please note: I am unable to create Mac builds for the moment. I suggest using the Linux version as a Mac user. The current link may be broken. - Completely reworked the profile selector. - Added automatic seed histories. If AMIDST detects a "history.txt" file next to it, it will write a time stamp followed by the seed for each seed you enter. - Added smooth fragment fading. (This may be disabled in the options menu) Enabling this will cause all fragments to fade in when loaded. - Most crashes now create a "crash dialog" containing a log that can easily be pasted. - A licenses window has been added to the help menu. This will contain all relevant license information for AMIDST and its libraries. - Added option to set the default world type to any of the world types or "prompt each time". - Rendering speeds have been vastly improved. - Fixed issue where files would not be properly closed. - Hidden files/folders now show when opening a world from a file/folder. - Added 1.7.4 to official version list. - A new option is availible in the Options menu called "Show Debug Info". Enabling this will add a small panel to the map viewer containing debug information on fragments. - AMIDST now returns "4" on crashes. This will change at a later date to include various error codes. - Mac OS X users should no longer experience the "corrupted" issue. - Added a "-mcpath " flag for users to specify the path to their .minecraft directory. - Added "-log " flag. Using this flag will cause AMIDST to write all log output to the specified file. AMIDST should create a file if it does not exist. - Added "-history " to specify where AMIDST should write seed history to. If AMIDST cannot find a file at the path you've specified, it will attempt to make one. - Duplicate biome colors are now supported. - default.json is not much cleaner. - Biome profiles no longer cause an empty profile list when there's a syntax error. - A new menu option for reloading your list of biome color profiles has been added. - Fixed issue where some Mac OS X users would not have their window refresh. - Fixed loading from amplified worlds. - Fixed the map jumping around when a menu was opened. - Selecting the default profile will now attempt to load 1.7.2. - Adjusted the organization of some menus. - Added 1.7.2 to official version list. - AMIDST will now only load the libraries specified by the selected version. - Added support for biome color profiles. An explanation of this will later be added to the wiki. Until then, please use check the latest forums posts or ask around. - Basic wiki page added to BitBucket here. - Mac OS X version now launches with extra memory. - AMIDST now loads all libraries contained in the .minecraft/libraries folder. - Greatly reduced the file size for AMIDST. - Increased performance for filling in image data. - Slightly reduce memory usage for structure generation. - Added official support for 13w37b. - Reduced memory usage from grid layer. - Increased performance for drawing biome layer. - Improved detection of multiplayer maps. - Major performance improvements for zoomed out maps. - Added spawn location icon. - Added option to toggle framerate panel in the menus. - Added official support for 13w38a/1.6.4. A big thanks to the people over at http://www.57digital.co.uk/ for their very generous support. Aside from using adf.ly, there are a few ways you can help improve AMIDST. Check out the GitHub page. Bug submissions, feature suggestions, and any improvements to the source code are always welcome. Due to requests, I have now added a donation link back in. Downloads & Versions No point in reading this if you don't download it! The EXE version now works! -Fixed a bug where it sometimes wouldn't work. -Should work with 1.9-pre 3. Officially. -Fixed several memory leaks that forced the program to stop working after awhile. -Made a few things use way less memory. 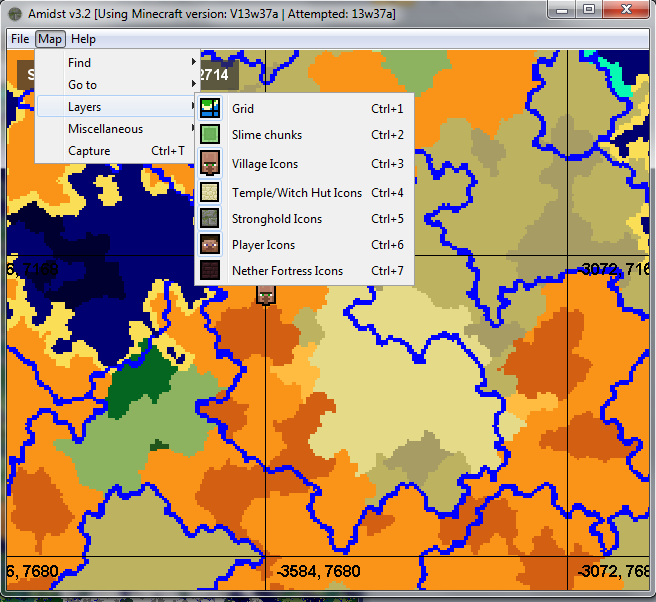 -Fixed a bug that would prevent any villages/markers from being accurate when a X/Z offset was used. -Changed icon for strongholds so they're more noticeable. -Added zoom in/out button to the map. -Mouse wheel also zooms in/out on the map. -I dunno, I spent way too many hours working on this, and now I'm tired. -(0.4.2) Fixed a UI bug that would make this application useless in Mac OS X. -Now is incredibly accurate! You should just be able to dig down. However, in rare cases you'll end up between the walls, just dig to the side or something. -Added support for the "invalid biome" issue. So it'll at least tell you that there's no stronghold there. -A reminder from the last version (Which was only out a day) seeds like "poppycock" will now be properly read! -Added support for non-number seeds. (i.e. if your seed was "watermelon" it was now correctly convert to a number as it would in minecraft) WARNING: Don't accidentally have a space in your seed number! It will mess things up! -Changed labels of stronghold 2/3 so they actually display the right numbers. -Greatly changed the formula for finding the second and third stronghold. This should be MUCH more accurate for both of those. -Added my name to the top! -I've only tested the first stronghold coordinates, the other two will probably NOT be accurate. Version 2.1 ---- Works with 1.8.1, all 1.9-pre, 1.0, 1.1, 12w03a - 12w08a, 1.2.4-1.2.5, 12w19a - 12w27a, 1.3-pre, 1.3.1, 1.3.2, 1.4.2, 1.4.5, 1.4.6, 1.4.7, 1.5.0, 1.5.1, 1.5.2. I dont understod how to use the program. I got 6 numbers, what they are? Anyway, the first row is what you want, just ignore the rest for now. I'm still trying to figure out why they don't work. I am using the texture pack AND the coordinates from your program I must be daft because I am only seeing "mine-shafts". Oh my god! This actually works! Thanks a bunch! What, does he not have the right to complain because it's not working for him? It may be working for everybody else, but it's not working for him. He's not judging the skills of the programmer, anyway. He never said he was a better programmer. Anyways, it's a nifty little tool, but it doesn't work very well for me. Have yet to find one. i wont need them anymore! Where do we find the coords there it should be a stronghold? Check out the original thread linked in the OP. Stronghold 2/3 should now be working a bit better. The 3rd dungeon coords Do not work for my seed. Not a Large issue since the first two Strongholds were within 25 blocks or so of the first 2. but number three is nowhere to be found. Just letting ya know that Number 3 can still be way off mark. This is an INSANELY usefull little program mate. Thanks for programming it. Yeah, it was pretty much a "best guess" kinda thing with the second two. 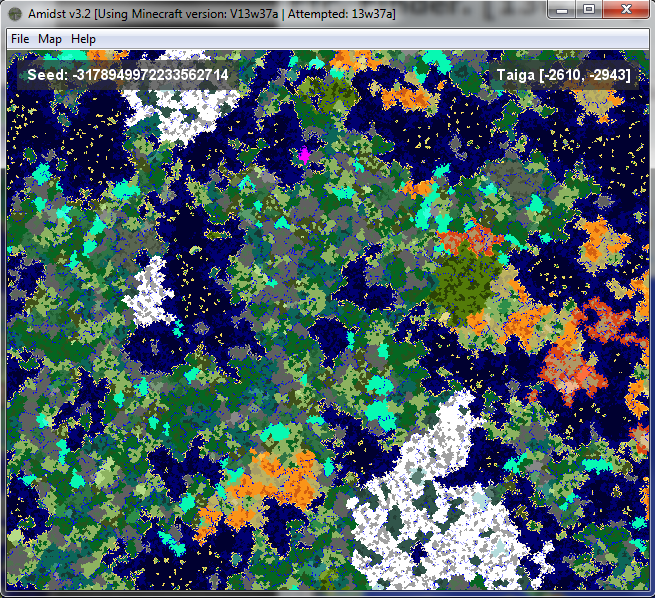 Without importing almost all the minecraft code I doubt I could accurately predict where they are. But I'll try to look into changing the code for the third one. On a side note, on one of the maps, I actually found the third one close to where it said, but the whole stonghold was only about two rooms large. Aye I was thinking this as well. Perhaps there may be an issue with the actual generation of the third stronghold. And Your program is actually VERY close to where it SHOULD be, but the game simply is not genning it. This I find very likely given the fact that the game doesnt even load snow biomes anymore, so yeah. I am leaning towards it being an issue with the game actually Generating the third Stronghold correctly, Not your program not finding it. As a side note, strongholds appear to have specific biomes they can/can't spawn in. The coordinates I've given belong to the highest point of each stronghold, usually a spiral staircase. Thanks a bunch, I really can't imagine how you figured it out in that short a time. Oh, by the way, does anyone have any suggestions for ways to improve this? I just used it to find one of the strongholds in a new world, and it was spot on. My coordinates were x: 664, z: -794 and my seed was -7564432966213283149 (it was randomly generated). Awesome tool, that's for sure!